Amelie just happened to come out during my most impressionable age, at least when it came to movies. I was graduating from high school, we were leaving the 90s behind, and every great film that I saw at this point still carries a big impact on my tastes, preferences, and memories. American Beauty, Memento, Amelie, ultra-original, high drama films like these were literally changing my life when they were released, and for that I’ll always be grateful. But aside from that, Amelie is just a phenomenal movie. It is what Americans desire in their foreign films: stories rich with texture, cinematography laden with European charm, a delivery that is slightly fantastic but purely emotional. 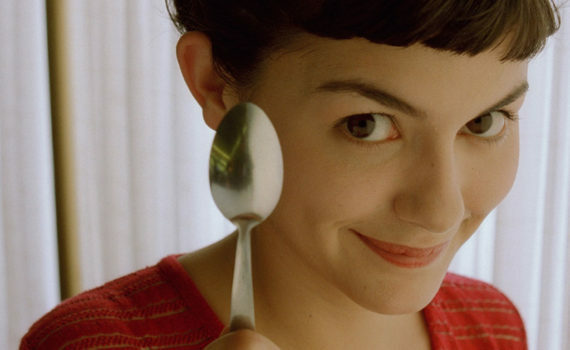 This is what we want, this is what Amelie delivers, and a more beautiful French film you will be hard-pressed to find. Amelie Poulain, the lonely, lovely child of two French parents were were marginally less than warmhearted. She grew up with an imagined cardiac defect that kept her out of activities, with a strict mother as a home teacher, with a medical father who never showed affection, and with an imagination buily upon the lack of real excitement in her daily life. As a young woman, Amelie lived by herself, kept to herself, stayed within the protection of her tiny world, and was afraid to venture out lest she be changed. But one small discovery opened up many doors for Amelie, allowing her to understand the impact that she might have on the lives of others. Incidentally, when doors like these are open, they become difficult to shut, and your own life may be impacted as well. I’m not sure there is a film more captivating, attractive, and well-intentioned than Amelie. It is the story of good, of the change that can ripple from one kind act, of the way humans affect other humans with their very glances, how we are all connected in this wild yet wonderful world. This is a movie to watch if you want to look on the bright side for an hour or two, something to revisit to renew your soul. And apart from that, it is also a magnificent film on every technical level. Tremendous direction, incredible imagination, hilarious moments, a spectacular sweeping scale, all balanced by great acting & lovable characters; what else were you looking for when you sat down to watch a screen present you with a story? Amelie is what the cinema is all about, why we watch, and something to appreciate not just once but once a year, a movie to hold on to.